But instead of purchasing alcohol, I stepped to the next stall where tiny cubes of cheese were lined up neatly and a tiny jar of honey, I could not imagine why. Then I got caught by the lady behind this very stall and she urged me to try the Pecorino cheese with the white truffle honey. Weird, right? You wouldn’t think honey and cheese can make such a handsome pair. But when I did dip a piece of pecorino into the honey and tasted it, I got so carried away by it that I immediately purchased a tiny portion of the pair for £10 – whether it was a rip-off, I did not have time to consider – this taste, I had to have it! Let’s face it, I would have ended up buying it, had I stood there thinking for another minute. If you have ever tried the Norwegian brown cheese, that is the most similar taste that I can think of. Pecorino is a hard, strong and a little salty – it is like Cheddar that has tasted the water of eternal life. And that truffle honey is not your average honey – it is probably even a little sweeter, but somehow not. It is really rather strange how exquisite it tasted, and these two together, well I think they were meant to be. Coming up soon on the blog: my surprise birthday-dessert is ready and the recipe and picture will be coming up soon. Hints: it involves strawberry, a lot of whisking and folding and Julia Child has a lot to do with it. Can you guess what it is? Also soon: FoodWishes.com‘s very own Chef John agreed to do a mini-interview with me via email – it is done, it is here and I will be posting it very shortly, so keep checking back! This entry was posted in Blog and tagged Chef John, Christmas, food, FoodWishes, honey, ingredient, Julia Child, market, pecorino, recipe, strawberry, truffle, wishes. Bookmark the permalink. 1 Response to Pecorino with white truffle honey, say what? 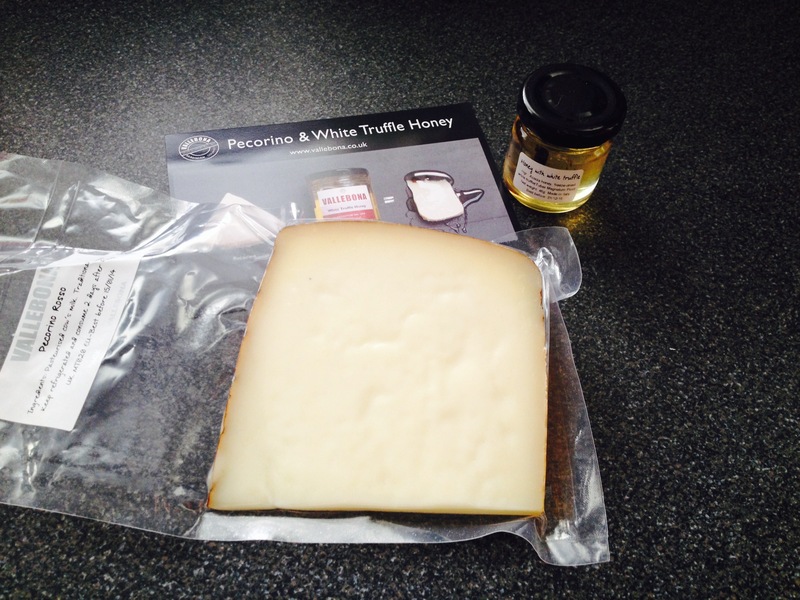 is it worth to try pecorino with any other honey?it sounds great!